Rather than waiting for people to just find your blog, go visit as many as you can! Follow other bloggers, leave good comments (here are some tips for commenting), and read a variety of blogs. Apart from getting you noticed, it will also motivate you, inspire new ideas, and help you understand how things works. I find RSS feeds on Feedly to be the best way of keeping myself updated on blogs I like. It doesn't clutter your inbox, and you won't miss them on Twitter and Facebook. There's no hard and fast rule, but it's always nice to go back and visit the blogs of people who comment on yours. They will appreciate it, and you may find some good bloggers this way. I always comment back and often, I make new blog friends! To make sure people keep coming back, read Eleven reasons why I won't return to your blog. It takes a lot of time to have an error-free site. In fact, it is a continuous process. Keep looking at your blog from a newcomer's eyes. Ask yourself: Is it easy to find things? Are my important posts highlighted? Is there enough information about me? Update your blog's sidebar often with your latest content. Check that all your links lead to the right place. It's easy to get lost once you're online. Make a list of priorities and have it close by, so you don't spend too much time pinning when you should be writing. My formula is to spend 30 per cent of my time writing, 20 per cent commenting on other blogs, and 50 per cent on social media. I don't do this every day but try to balance my time across the week. Your break-up may depend on what your priorities are, but make a list of tasks important to you. Which brings me to another point about organising your time - don't try to be everywhere, all the time! Each social media site is useful in its own way, but only some will bring you good returns over time. It takes time to identify what sites work best for you compared to on how much time you spend on them. I used to almost exclusively be on Twitter, but now I find Pinterest to be a good driver of traffic. I use Facebook for engagement and Google+ for some exposure. I try to focus on two channels which I use frequently. Your followers and readers will appreciate it if you direct them to more good stuff to read, or to something that will be useful to them. It's always a good idea to share others' work on social media and your blog. Early on, I started doing my Bloggy Reads of the week, and it's still going strong! I also like to share on my Good Reads board on Pinterest. Writing for others doesn't mean that you should only be a crowd-pleaser. If you want your blog to stand out, you have to be yourself. I always try to write sincerely and only choose subjects in which I either have personal experience or have a clear opinion about. When you first start blogging, organising your posts, documents, and pictures is the last thing on your mind. But in the long run, it pays to have your files sorted into the right folders. It's a good idea to use a service like Dropbox or Google Drive to sync your files online. Also have a system in place to back up your blog (here's an article on how to do it). I always have a notebook at hand to plan my posts and jot down my ideas. It's easy to find printable and online blogging calendars. Planning your posts also lets you see whether your posts are in line with your original theme. I have never turned down an opportunity to write for another blog. There's no downside to guest blogging, as long as what you are writing is original and meaningful. The exposure from guest posts is immense, especially for new bloggers. A word of advice: don't be too picky about where your posts are published, as long as the host sites are family-friendly! The term 'search engine optimisation' used to scare me, but I learned that it's not as difficult as it looks. SEO is a rewarding exercise. See my SEO checklist before you publish a post for some easy tips. Making money was never one of my aims from blogging, and it was only in the past few months that I started getting offers for sponsorship. Whether you want to monetise your blog or not is up to you, but building good content takes time. And that is the basis of a marketable blog. Whether you find them in a Facebook group, in a Tribe, or on a community website, being in the company of other bloggers is good for you. You can share your thoughts, troubleshoot problems, or ask for feedback from other bloggers. Being a part of a blogging group also keeps you going, but it can take time to find the right one for you. This doesn't mean that you have to change the look of your blog often, but you can add little things, such as a new series, guest posts, or co-host a linky. When you are ready, you can even start your own blog hop. I'll add another to this list - The first year is always the hardest. A lot of time goes into promoting your blog, making it popular among your readers, and settling on the perfect design. The end of a blogging year is a good time to review where your blog stands and where you want it to be. What has your experience of blogging taught you? Do you want to start a blog? Check out this Beginner's Guide to Successful Blogging which you can also download as PDF. I think the combination of numbers 7 and 8 is so important. There's a healthy balance between giving your audience what they want and still writing about topics and in a voice that's right for you. The best bloggers are able to accomplish both of those simultaneously! You're right. It is important to find the right balance between the two, and it might just click with the readers! Very helpful, especially since I'm in Week 3 of my new blog and my new site! I knew that I needed to have a blogging calendar and was just about to start organizing something. I had no idea that you could find a template online for that, though. I guess there's something for everyone somewhere, right? ;) Congrats on your year anniversary, btw! Great advice! I have been blogging for three years but just really dove into it last spring. I had no idea what all went into "making it" as a blogger. I love it, but it does take so much time. Using an editorial calendar has helped so much. I'm just a few months in, Tarana. I really appreciate all your great advice. I'm finding it difficult to keep all the balls in the air at times. You inspire me to keep moving forward and I plan to visit more often. Thank you!! Some excellent points Tarana! During a crazy January whenI had to focus on too many non-blog obligations one thing I really missed was keeping up and commenting on blogs I really enjoy...such as yours! Thank you, Dawn! True, you can find a lot of resources for blogging online. There is definitely a lot of work now, Lisa. At one time, all you had to do was write! Thank you for your kind words, Jennifer! I'm so glad you found my tips useful. Aw, thank you, Kriss! Hope everything is under control now. These are great tips! I have learned a lot in my blogging time and I am still learning new things every day! Yes, it will. I'm sure you'll figure out a way to make it work! Thanks, glad you liked the tips! These are all such excellent tips, Tarana, with really specific advice. You have learnt so much in such a short time - I'm quite in awe! I have never guest blogged, but will definitely jump at the opportunity if it ever arises. When I started blogging, about 8 and a half months ago, I honestly had no idea of how important social media was. I have to admit, I was disappointed to find out that it played such an enormous role because I wasn't involved in any social media platform whatsoever. All I wanted to do is write! It was really interesting reading the breakdown of how much time you estimate you spend writing, commenting and being active on social media. I think I do the first two well, but fail miserably at the last one! Thanks for compiling such an informative post. I'm going to pin your list and then go and check out your other links. I was just like you, Lizzy. All I wanted to do was write, but I realised that to reach out to a larger audience, I had to wade into the social media ocean! Happy you liked my tips, Victoria! Great post. 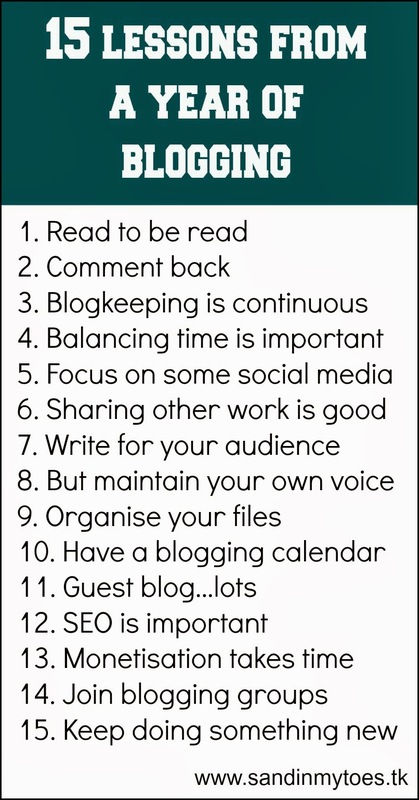 I've been blogging since April, so some really good tips here. Pinterest can be so addictive, right? Thank you, Chelsea! 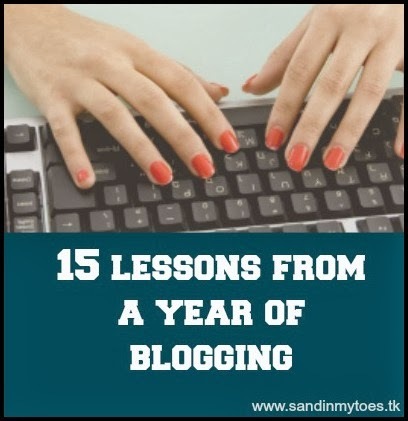 I don't like the idea of blogging in isolation! These are really good tips and reminders. I'm glad I've been doing them now and thanks for affirming through this post, at least I know I'm doing the right thing. :) SEO is something I have to work on though and I haven't tried to guest blog.. looking forward to doing them soon. Great weekend to you! Happy you liked the tips, Rea. Do come back and share how SEO goes for you! The points you mentioned makes so much sense and I am going follow them to keep my blog active and going. I was in the same position as you! Good luck with your blog - I'm going to check it out. Thanks for going through my blog. Just to mention, I now blog at www.thoughtsoverchai.wordpress.com. My mistake I didnt mention it to you earlier.I am looking forward to see you there. Great tips and I love the one about maintaining your own voice. I think its do important to step back every so often and evaluate and just make sure your blog hasn't run away in some random direction because of what may be fashionable at the time. Paula, it really depends on where you're from. For instance, in Dubai, smaller numbers would be okay because it's a small country! But I remember reading in a forum that sponsors are only interested in blogs with pageviews above 20K. Thanks so much for this post TK!! I am also just a starter and this has given me such a heads up!! Need to get a bit more organised i guess, the time just flies when you are online. Happy you liked the tips, Alka!